According to Nickelodeon's parent company, Viacom, the one and only authorized Krusty Krab restaurant is located far away in SpongeBob SquarePants' hometown of Bikini Bottom. As reported by The Hollywood Reporter, the media giant recently filed a lawsuit against a Houston-based investment company, claiming it is infringing on SpongeBob trademarks by reportedly operating a real-life restaurant called, you guessed it, "The Krusty Krab." As anyone who currently has the SpongeBob them song stuck in their head (ugh!) 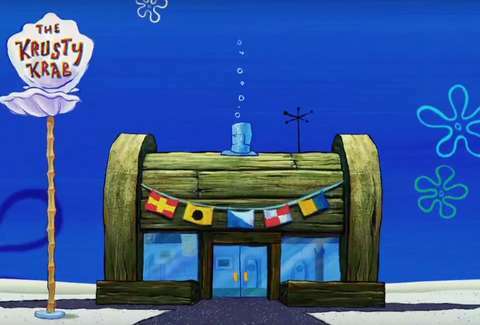 knows, the Krusty Krab is owned by Mr. Krabs and is home to the popular Krabby Patty burger. As seen in hundreds of episodes of the cartoon, SpongeBob works there as a fry cook, or "Vice Assistant General Manager in charge of certain things," to be exact. Viacom already sells several Krusty Krab products such as toys and aquarium magnets, and wants to protect its business should it decide to open an actual Krusty Krab restaurant some day, like it did with licensing the rights to Bubba Gump Shrimp Co., based on Forrest Gump. Details about the allegedly infringing restaurant are unclear, but the company in question, IJR Capital Investments, is seeking to trademark "The Krusty Krab" for its own purposes, hence the lawsuit. However, its attorneys deny the allegations and have even gone as far to say that IJR "declines to cease use" of the name, according to the report. Is it just us, or does this sound like an elaborate scheme by none other than greedy Mr. Krabs himself? Hopefully, this is all resolved over a pile of Krabby Patties. Tony Merevick is Cities News Editor at Thrillist and . Send news tips to news@thrillist.com and follow him on Twitter @tonymerevick.